I like cultural theory because it offers a way of trying not to fool yourself. 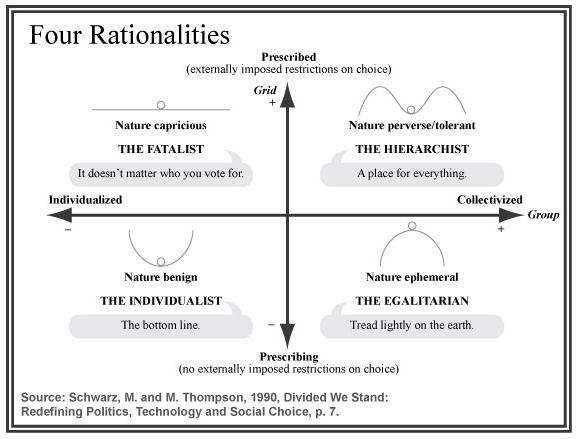 Most of the time we see ourselves as fairly rational and everyone else as wrong, or stubborn, or even stupid. Our own way of life appears to be nothing but common sense while others seem to behave senselessly. This can’t really be correct, but our daily lives depend on us fooling ourselves. If we doubted too much our own ability to understand the world, how could we make decisions? We must be right, right? An alternative is to consider the possibility of ‘plural rationalities’. That’s a way of suggesting there is more than one way of seeing the world and more than one way of organising. It might help to consider that people and institutions aren’t being deliberately annoying: they just have varying worldviews, or cultural biases. But on the whole these worldviews are ‘outsideless’. That is to say they don’t just happen in our heads and hearts, but also within the institutions and environments in which we exist. Like Jim Carey’s character in the movie, The Truman Show, we find it hard to move outside of the worldview we already inhabit, to see what it’s like from another perspective. It may be hard, but it’s not impossible. If I wish to relate to others, to be a social being, grid-group cultural theory suggests there are only four stable ways of doing this. I can and do choose, but only between these four. If that seems a tight fit, remember that most sociological typologies only allow for two options (such as ‘left’ or ‘right’, ‘mechanical’ versus ‘organic’, and so on). Four options seems like a marked improvement. Here’s a short article from the Guardian newspaper from 2007 that explains grid-group cultural theory quite succinctly. It describes a lecture the anthropologist Mary Douglas gave for the Young Foundation in conjunction with University College London. Messy institutions for wicked problems: How to generate clumsy solutions? Environment and Planning C: Government and Policy 33 (6), 2015, 1679-1696. The link to the article in the Guardian is broken.